Unlike other galleries, the Goffi Carboni Gallery has always devoted itself to art as an international phenomenon rather than one limited to local or Italian forms of expression. It has always taken a lively interest in the artistic manifestations of countries such as France, England and Holland, such countries being the source of several of the objects it displays. 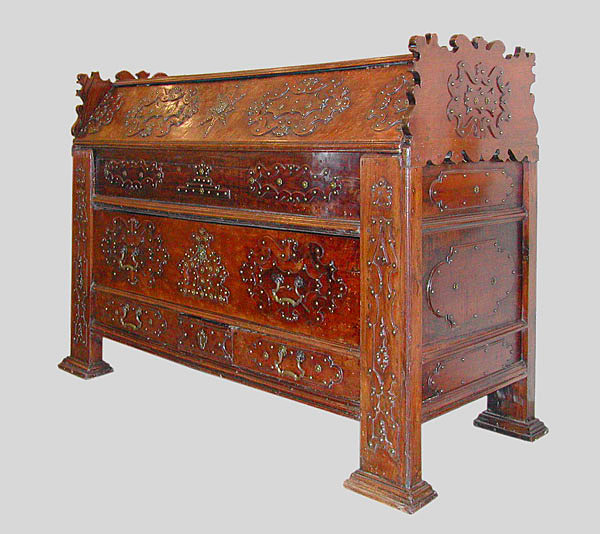 Italian, English, French and Dutch furniture as well as clocks, bronzes, chandeliers, drawings, watercolours and oils on canvas are all dealt in together with antique prints for decorative or collection purposes. Roman marble head of Narcissus over a neoclassical body. 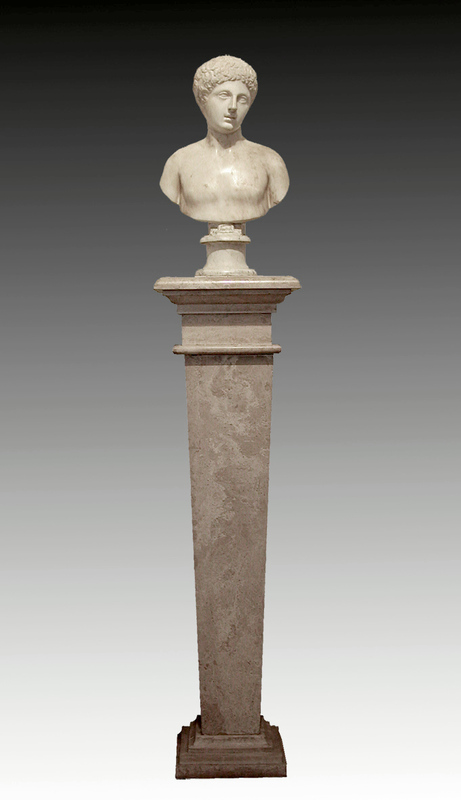 Rome, 1st-2nd Century AD, 18 cm high, the head, 115 cm high whith the base. 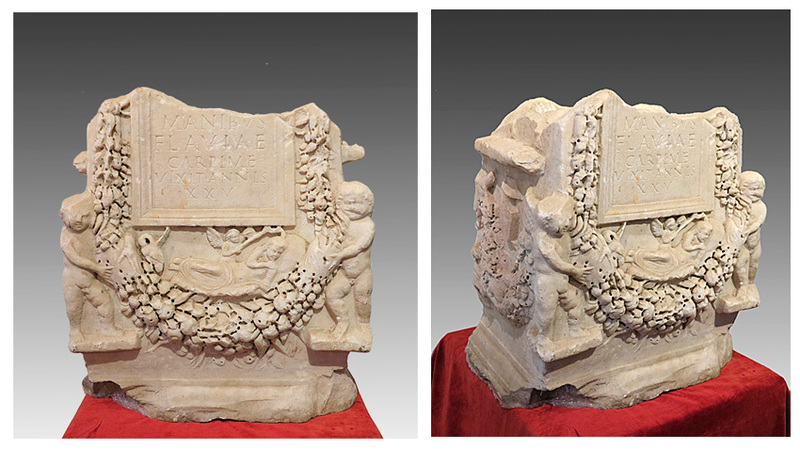 A Roman Marble Funerary Altar. Cm. 55 x 50 x 32. 1st Century A.D.
Federico Faruffini (1831-1869), "The Artist's dream", oil on canavas, cm 51x39. From the Dovizielli Collection. 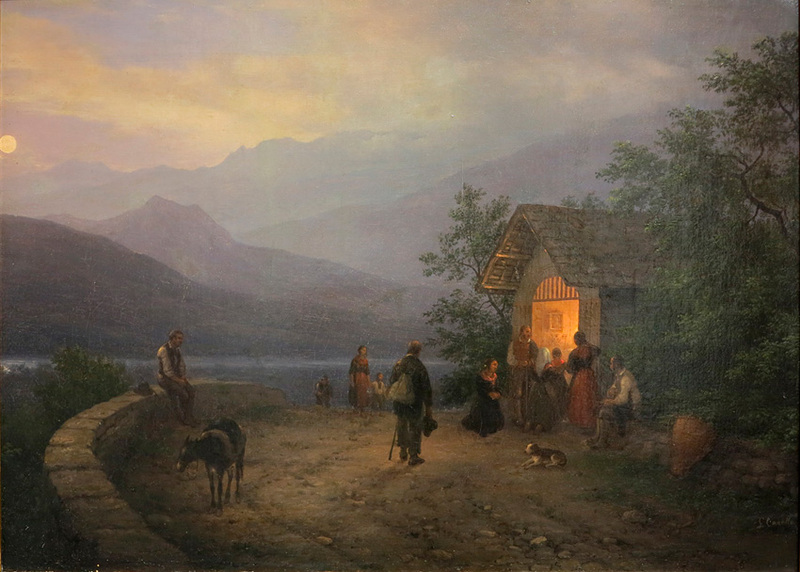 Giuseppe Canella (1788-1847), "Veduta notturna sul lago con una edicola religiosa", dipinto ad olio su tela cm.44x66, firmato. Provenienza Collezione Dovizielli. 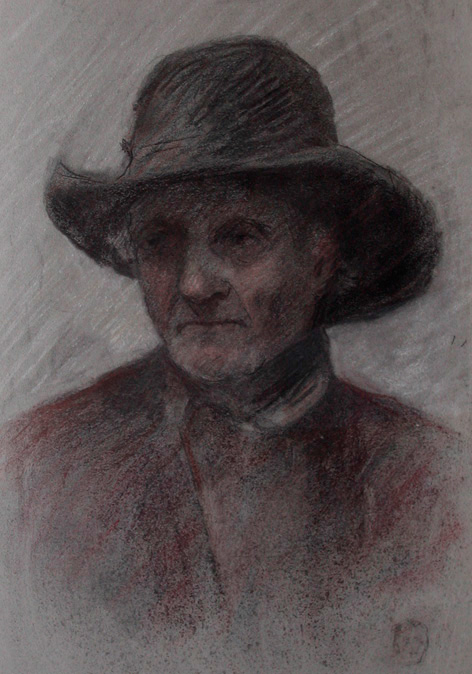 Attilio Simonetti (1843-1925), portrait of a farmer.Pastel on paper, 46 x 32 cm. From the Simonetti Collections. Ippolito Caffi (Belluno 1809-1866), Cernobbio and Como lake. 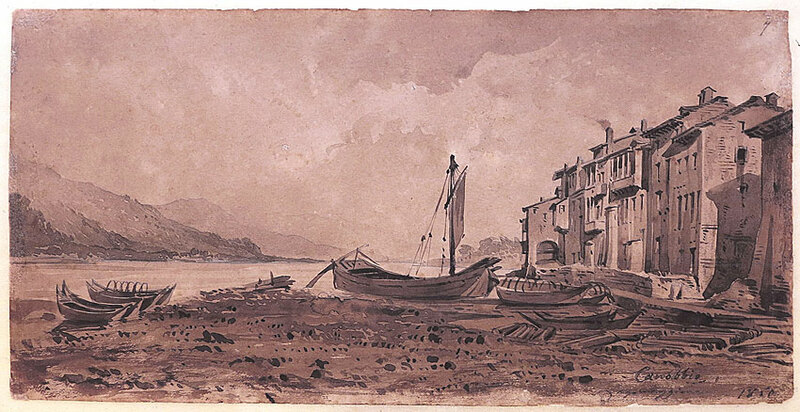 Pen and watercolour on paper, dated 1850. From the Dovizielli Collection. Carnevale 2019. 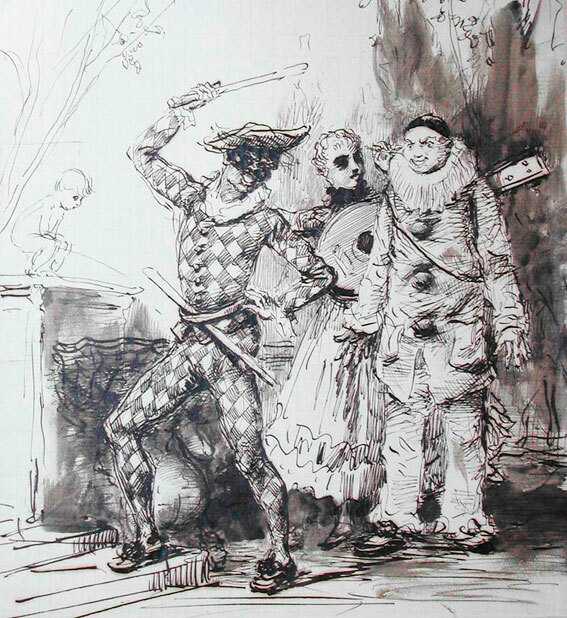 Attilio Simonetti (1843-1925), Arlecchino, Colombina e Pierrot, tre maschere della Commedia dell'Arte. Penna e inchiostro su carta. Cm 26 x 21. Attilio Simonetti (1843-1925), portrait of a gentleman in 18th century clothes. Pen with black and brown ink on paper. Signed. 14 x 11 cm. From the Simonetti Colection. Carnevale 2019. 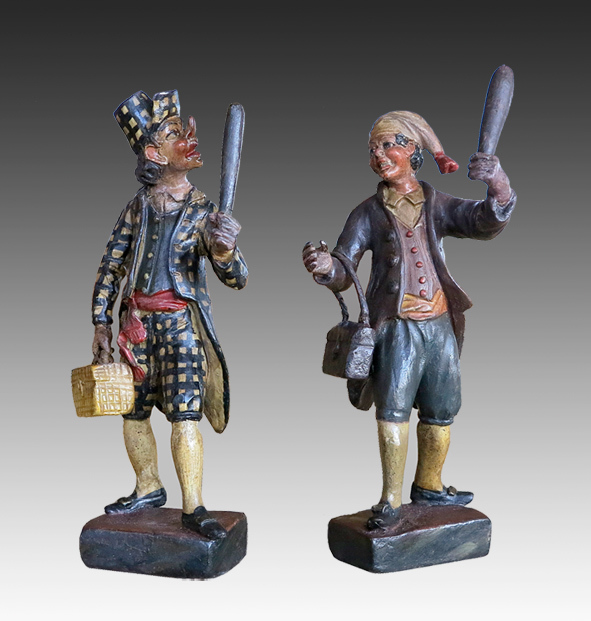 Coppia di figurine della Commedia dell'Arte, terracotta dipinta, Milano, sec. XIX. H. cm. 19. 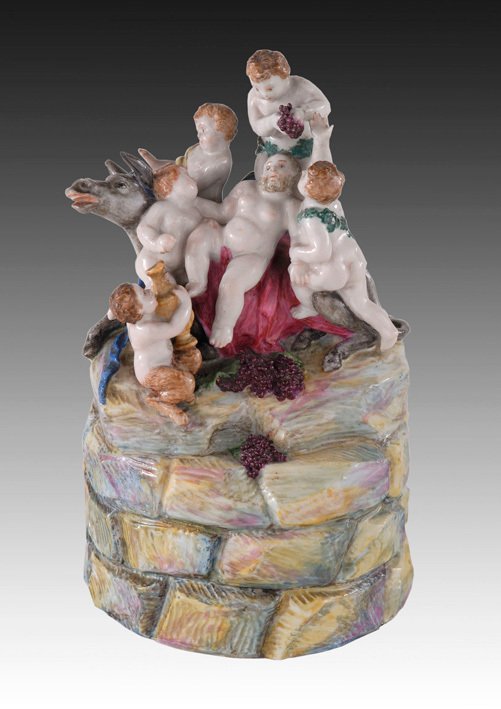 Bacchus surrounded by Putty, Doccia porcelain, 18th century. 18 cm high. 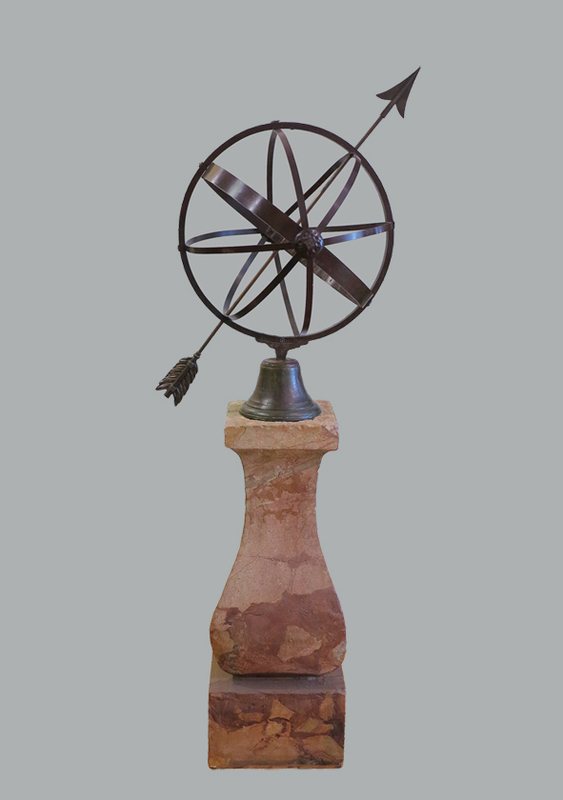 Metal Armillary Sphere on Portasanta Marble Pedestal, 18th/19th century. 112 cm high. 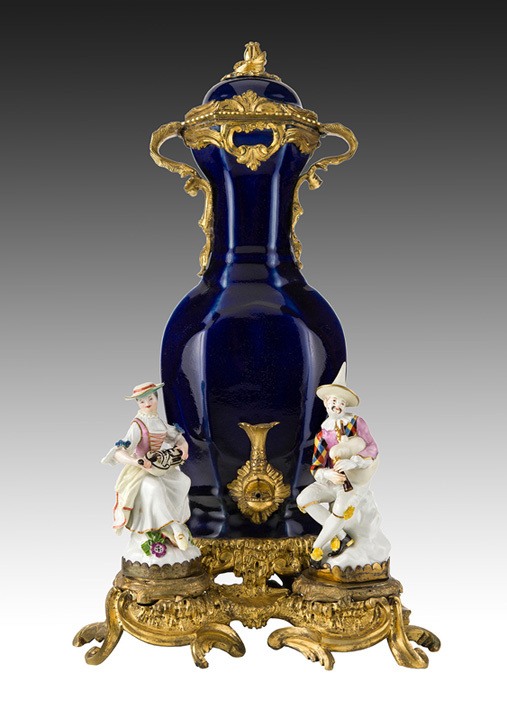 Chinese porcelain vase from the Kangxi period (1662-1722), mounted in France in gilded bronze and with two German Meissen porcelains depicting musicians. France, 18th Century. From Manlio Goffi Collection. 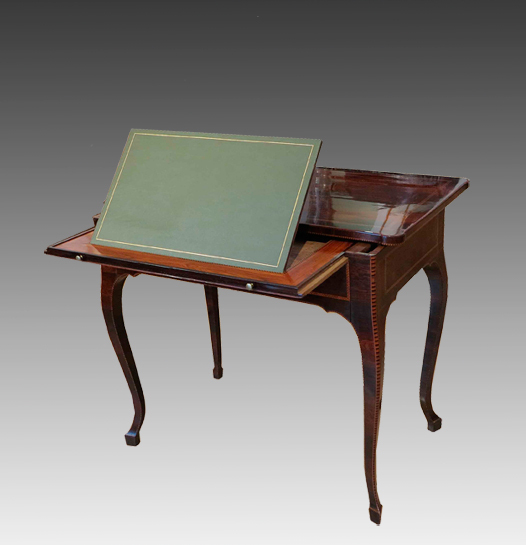 Florentine desk in rosewood. 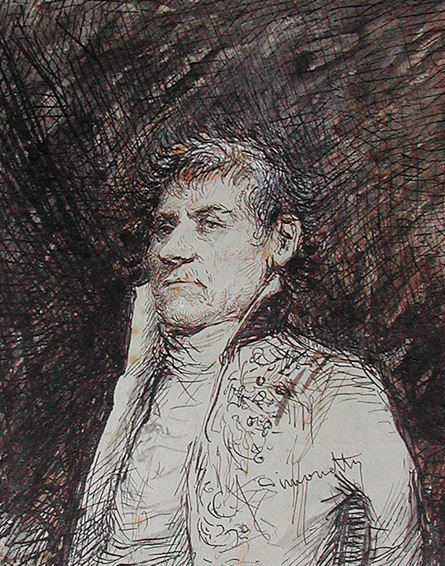 Last quarter of the 18th century. From the Simonetti Collection. Bolognese arcile in walnut with heavy bugnatura. 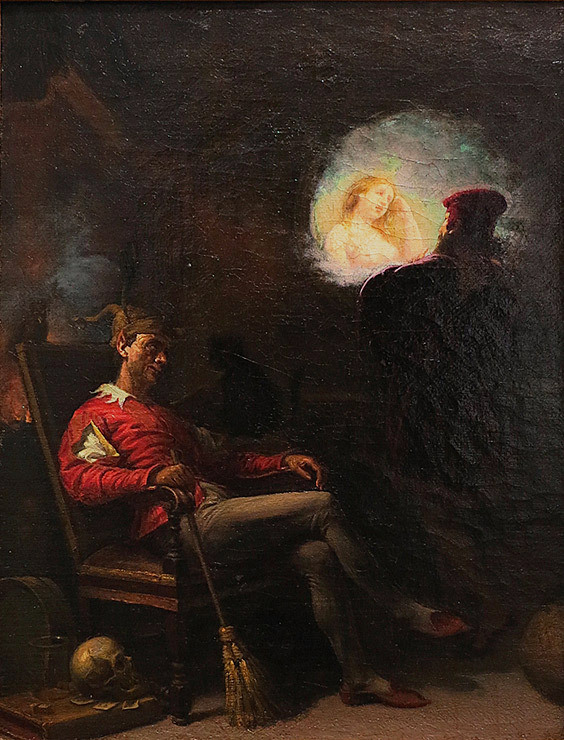 Bologna, beginning of the 18th century, 135 x 196 x 83 cm. 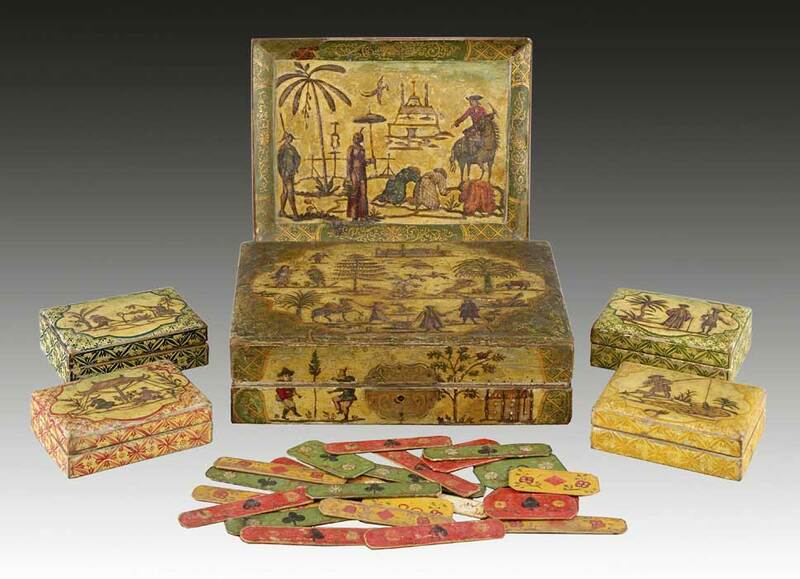 Venetian Lacca Povera game box, 18th century. Cm 4,2 x 17,8 x 13,2. 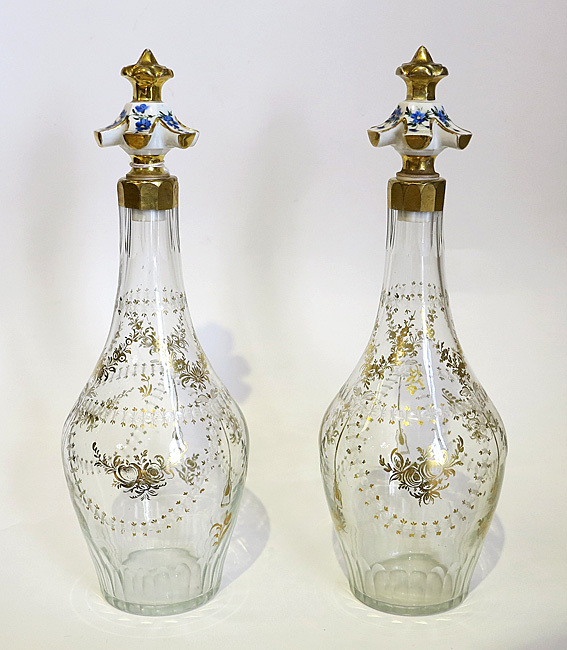 A pair of bottle in blown glass with porcelain plug. Venice, 19th century. 31 cm high. 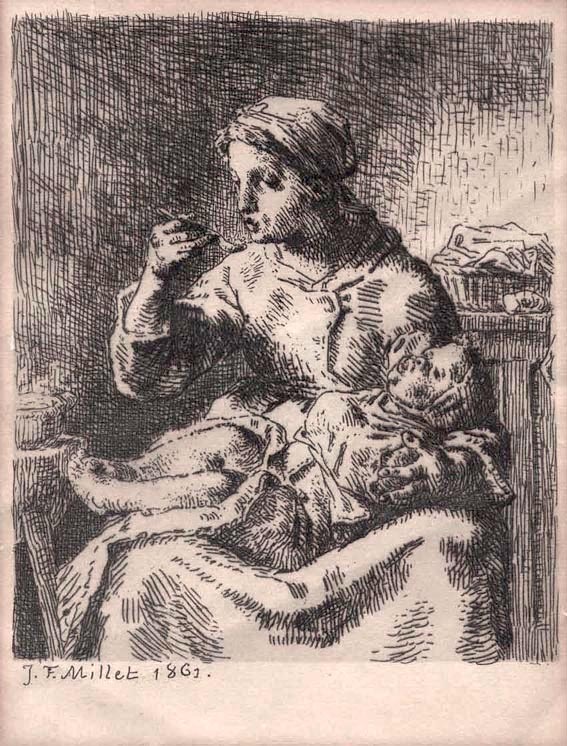 Jean-Francois Millet (1814 - 1875), "La Bouillie", etching, 1861. 18,6 x 15,7 Cm. 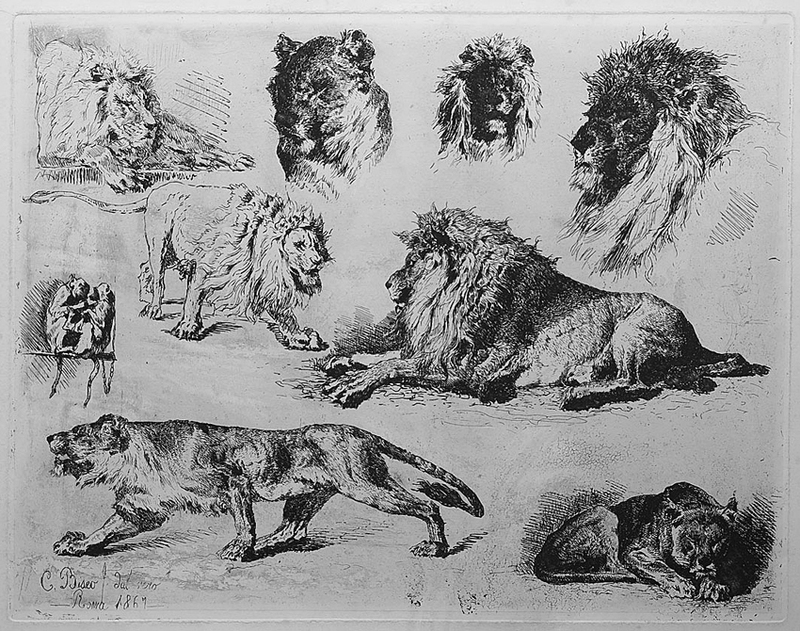 Cesare Biseo (1843-1909), "Studies of lions", etching and drypoint, signed C.Biseo, dal vero_ Roma 1869. With a dedication to his friend, the painter Attilio Simonetti. Printed on a chine collé paper. 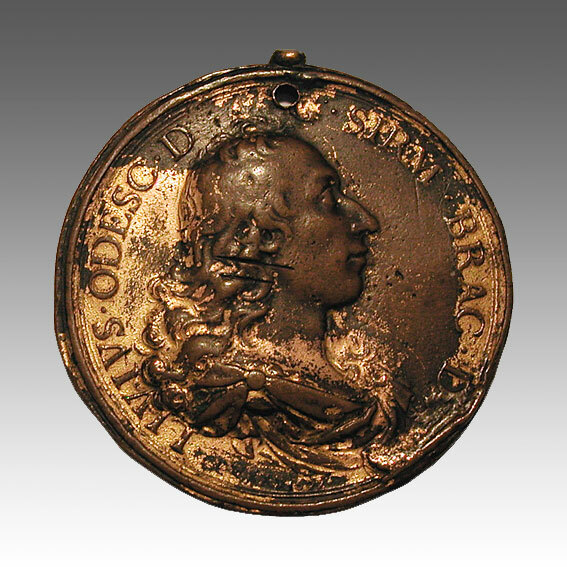 Livio Odescalchi, Duke of Bracciano (1652-1713), gilded bronze medal, 1699. 59,5 mm. 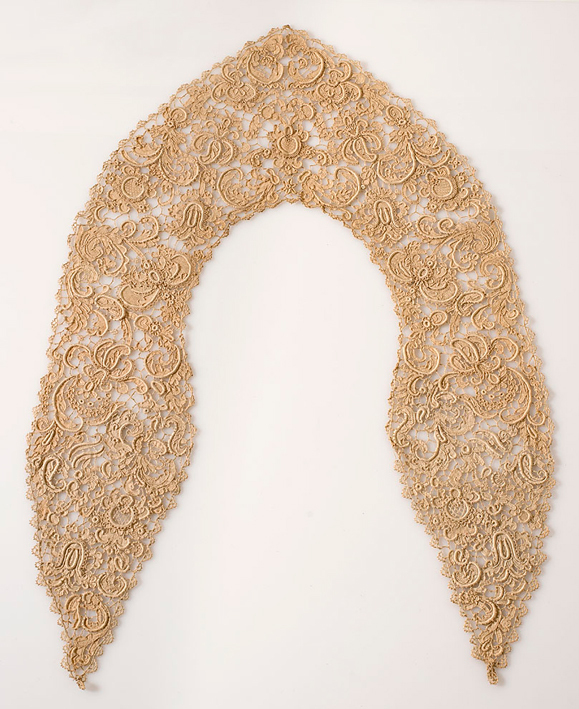 Gros point de Venise lace collar, Venice, third quarth of 17th centuty. 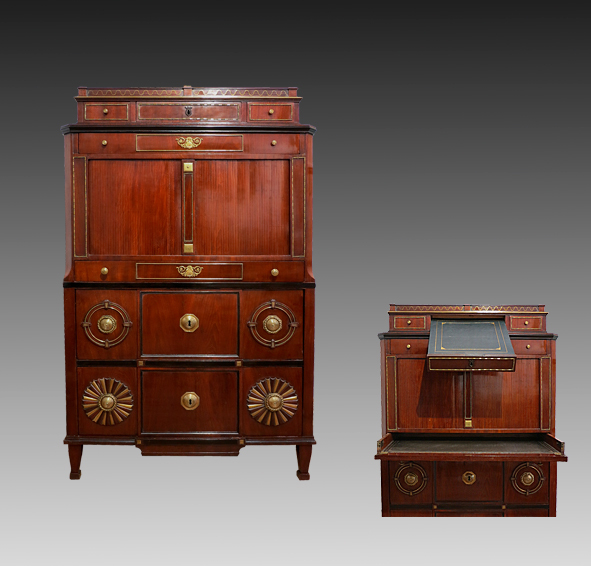 Provenience: Simonetti Collections. 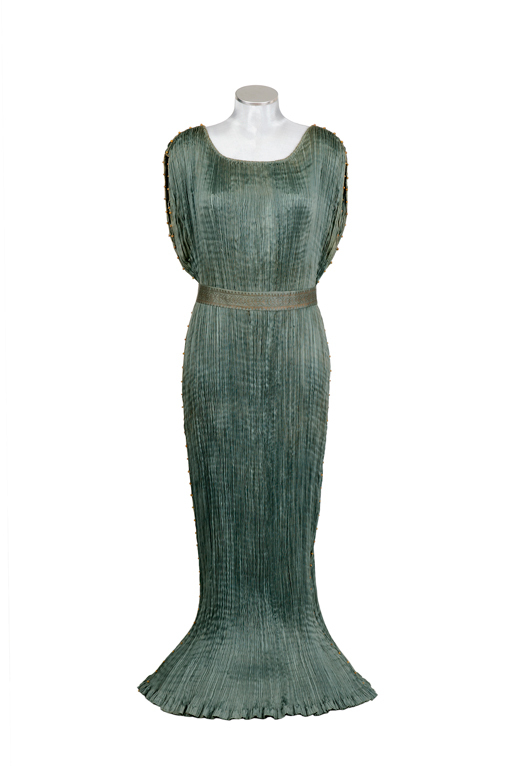 Mariano Fortuny y Madrazo (1871-1949), Delphos Dress made of very fine pleats on silk, 1920 circa. Exposed at the exhibition “La Divina Marchesa”, Venice, Palazzo Fortuny, 4 October 2014 - 8 March 2015. From the Simonetti Collections.